Iowa State's Mayly Sanchez is part of the international Long Baseline Neutrino Experiment. Credit: George Joch/courtesy of Argonne National Laboratory. Hundreds of physicists from around the world are making plans to shoot the world's most intense beam of neutrinos from Illinois, underground through Iowa, all the way to a former gold mine in South Dakota. And Iowa State University's Mayly Sanchez is part of the research team. Sanchez, an assistant professor of physics and astronomy, is working to develop the next generation of detectors to pick up the trail of neutrinos, subatomic particles that are among the most abundant in the universe and normally race through matter without leaving a trace. "Advances in material sciences are allowing us to make photodetectors that are larger, cheaper, better," said Sanchez. "They'll have a larger surface area and be better able to measure points in space with better timing. The question is, can we make a better experiment?" Sanchez's work is supported by a five-year, $709,000 grant from the National Science Foundation's Faculty Early Career Development Program. The early career grants support junior faculty identified as teacher-scholars through outstanding research, excellent education and the integration of education and research. The grant allows Sanchez to contribute to the proposed Long Baseline Neutrino Experiment - a $900 million collaboration of 300-plus researchers led by the Fermi, Brookhaven and Los Alamos national laboratories of the U.S. Department of Energy. The experiment would send a neutrino beam 800 miles - that's the long baseline - from the Fermi National Accelerator Laboratory in Batavia, Ill., to the Homestake Mine in Lead, S.D., to see how the neutrinos change over distance. Sanchez is working to develop photodetectors for a proposed neutrino water Cherenkov detector as big as a 20-story building. The detector would be built deep underground at the Homestake Mine. The detector is designed to spot Cherenkov light, the blue glow emitted when a charged particle passes through matter faster than light. Passing light is possible because matter - that's water in the case of these detectors - slows light more than subatomic particles. Neutrino physicists surround huge pools of water with sensitive photodetectors to find any Cherenkov light emitted when chargeless neutrinos hit hydrogen and oxygen atoms and throw off charged electrons and muons. Current detectors use 10- to 12-inch photodetectors that cost $1,500 each. Because the long baseline experiment will need 45,000 photodetectors, the size and expense of current technology has physicists looking for a different kind of photodetector. Sanchez is working with researchers at Argonne National Laboratory in Argonne, Ill., to develop and test photodetectors that take advantage of materials and nanotechnology advancements. As part of the project, Sanchez expects to establish a photodetector testing laboratory on the Iowa State campus. 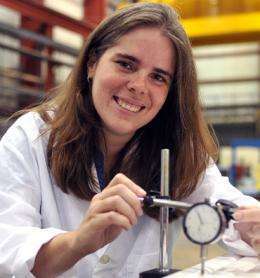 She'll also lead the group working to calibrate the photodetectors as they're developed. Iowa State graduate student Tian Xin and undergraduate Abhishek Vemuri are also working on the project. "We're trying to demonstrate that you can use these new photodetectors and improve the physics capabilities," Sanchez said. The Department of Energy's long baseline experiment is designed to answer some fundamental questions of physics: What role did neutrinos play in the evolution of the universe? Why do we live in a universe dominated by matter? Why do neutrinos have masses smaller than other subatomic particles? And what are the masses of the three kinds or neutrinos - the electron, muon and tau? Sanchez is a veteran of neutrino experiments, working on the MINOS and NOvA experiments designed to study neutrinos sent from Fermilab to detectors in northern Minnesota. It's a scientific and engineering challenge to probe the mysteries of neutrino physics. "The challenge is the probability of neutrinos reacting with matter is really, really small," Sanchez said. "And so we need really, really large detectors and very intense beams of neutrinos." But, she said, "Neutrino physics is very exciting. That's the reason I'm doing this."